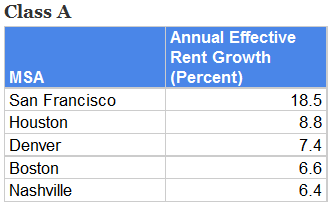 Top 5 Apartmentment Building Investment Markets for Rent Growth, by Asset Class. 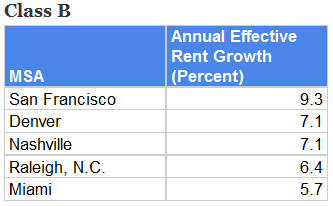 In an update to our earlier update on top markets, Axiometrics has put out a report on the top 5 apartment building investment markets for rent growth by asset class. Denver is the only other apartment market to make it onto all three lists, with Boston (in class A & C), Nashville (A & B) and Raleigh NC (B & C) making two lists. Other cities making solo appearances are Houston (A), Miami (B) and NYC (C). Previous Previous post: The Cult of Stocks is dying, and at 0% rates bonds have nowhere to go but down Says Bill Gross. Time for apartment building investments? 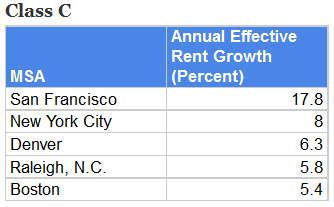 Next Next post: What is the average annual per unit expense for an apartment building investment? Great reader question answered.